Politicians will always surprise us in how creative they can be to solve economic crisis. Some of them tried to raise taxes. It works up to a certain stage. Others tried to make taxes lower. Again, it has its own restrictions. And others, well, decided to sell their treasures in terms of Art collection. Like the French government who dares thinking ti sell Leonardo Da Vinci Mona Lisa. Really??? What would Katherine Watson think about it? The on going increase of private art collections are bringing a game change in the art museums landscape. This year, art donation from private owners to public museums dropped by almost 6% while art auctions are amazingly increasing. Today, museums cannot fight anymore against private collectors. The Fine art auction market is not new. It all started in the 17th century and for centuries it was a small and very secret market made of passionate people and museums. It was in the 1980’s where the explosion of the market started. Industrial and financial fortunes started investing in art as inflation and banks bankruptcy would not represent good news for those billionaires money. In 2007, the fine art auction market crossed the line of US$1 billion and since then there is no limit anymore. When a Francis Bacon triptych reached US$ 142 million, then we started realizing the problem. The art market is populated with billionaires from all over the world who are looking desperately to invest their money. Amazing art pieces that will probably never see the light of an exhibition hall, so it will be lost for generations of people. For Katherine Watson in the movie Mona Lisa smile, nothing is more precious than freedom. By letting the art collections going private, it is a big blockage in terms of human heritage. Several art private collectors are even thinking to open their own private museums rather than donate or rent their art pieces to public museums. That’s the case of Alice Walton, heiress of the Wall-mart fortune. Don Fischer, founder of GAP is also working in a private museum project. Do not see in this only a philanthropic motivation. In certain countries like the USA, there are laws about tax exonerations if a donation to a museum is accomplished. According to philanthropynewsdigest.org there would be even cases of art private collectors who would cut deals with certain museums. They would “donate” certain art pieces while the objects would remain at their own private homes. For ages, rich families with money problems would solve their issues by selling family jewelry and art pieces. It is a common thing. By the way that was how several public museums would acquire beautiful pieces of artwork. Now the new trend is for Governments to do it as well. This is not new but recently the news fired up the fact French Government would sell Leonardo da Vinci Mona Lisa. Sacrilege! In 1962, Mona Lisa was evaluated at US$ 100 million. This was before a art tour in the USA. As insurance companies needed to evaluate the value of Da Vinci’s work, this estimation was ordered. 52 years later, some experts say the painting is priceless!!! Others would evaluate Mona Lisa around US$ 1 Billion. Impossible to sell? Not really. When you think that all Billionaires around the world accumulate US$ 1 Trillion, what is one billion today? Peanuts. When you see the American high-tech company Facebook spend US$ 17 billion to buy the App company What’s up, it would not be a problem to pay just one billion. Why France would sell such a valuable piece or art? Even if the sale price would reach US$ 1 billion, the entire French debt reaches today 2’000 billion. So it would be a drop in the Ocean. Other governments and states have used this strategy to pay their debts. In 2013, the city of Detroit in the USA was on the limits of bankruptcy and decided to sell the main collections of the Detroit Institute of arts. From Van Gogh to Picasso, they raised US$ 11 billion, which allowed to pay the city debt. Portugal is about to sell 85 art pieces from the famous Spanish painter Joan Miró. 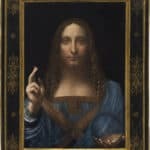 For a total of € 36 million it would be the largest auction for the painter. In this case, we are not sure it would help the Portuguese state as their debt is around € 210 billion. So everybody is now waiting for the French decision. For centuries, France was the protector of arts. It is also why Leonardo da Vinci went to live in France. After being blocked in many ways by the Medici family, thr artist decided to be under the protection of the French king François 1er. He crossed the Alps on a donkey in 1516 and he carried with him the Mona Lisa painting. Now, almost 500 years after, France would sell the precious treasure of Leonardo da Vinci? Rude. We hope that France will give the example and be truthful to its engagements even 5 centuries later. Info sourced at France24 and Wikipedia. All content is copyrighted with no reproduction rights available.